Free download Little Soldiers PC Game. It is very interesting game for computer. It is puzzle and logical game. You have to use your mind to play Little Soldiers game. 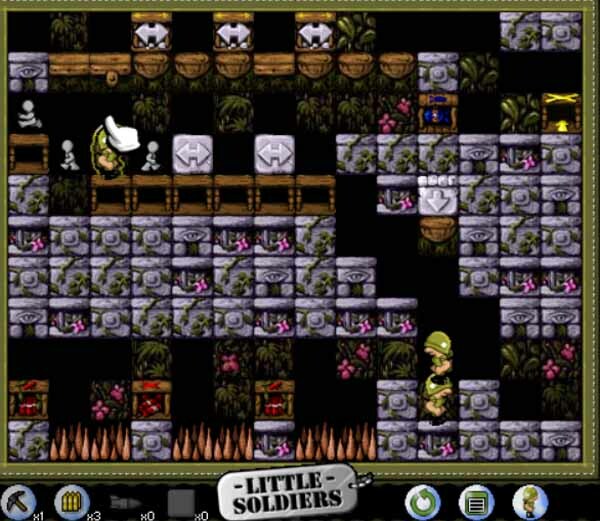 Little Soldiers PC game is available to try free. This is outstanding demo, that can be played free on your PC in your spare time. There are various missions in Little Soldiers game. This game is very light weight and easy to install and play. After installing, run the game and you are ready to play it. Wait a little bit as the menu will appear. There are three menu that are play, level and options. To play the game Little Soldiers, just click on Play. From level menu, you can select any level directly. Little Soldiers PC game has 40 missions to play. In demo version, you can play 6 missions free. Options menu has only sound and music on/off options. The first mission/level is Kinetics. In this first mission, you are trained to walk, climb and jump. By following the steps, you can easily complete this level. You have to use only mouse buttons to play the game. You have to reach exit point without falling down and missing the life of your soldier. In second mission, you will learn how to dig and shoot. At the bottom of the screen, you will see your tools such as digger, shoot etc. Shoot option will use to shoot and destroy the hurdles on the way. 3rd mission is chain reaction where you have to select a hurdle connected to other. You have only one shoot so get closer to hurdle and use it. It will destroy all the chain of hurdles and you can complete the mission easily. Always use jump to prevent your soldier to fall down.